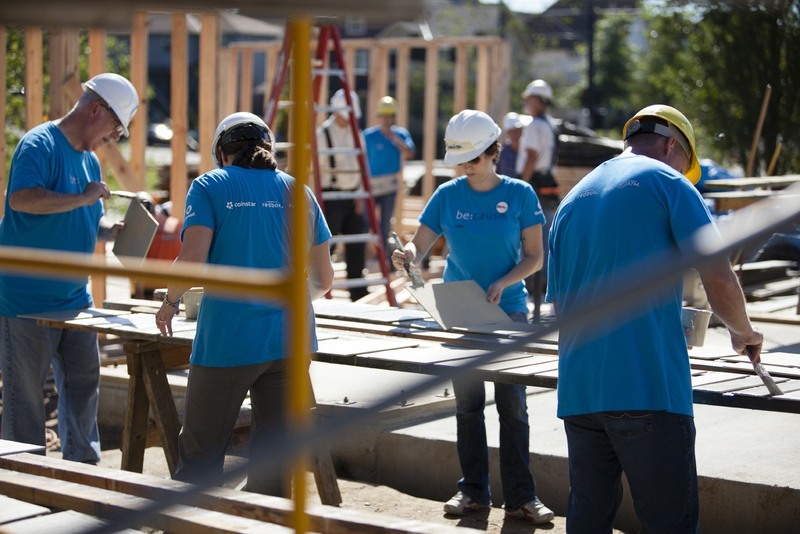 Over the last decade we’ve seen a steady increase in corporate volunteer programs in the U.S. Since the global recession, in particular, companies of all sizes – from startups to the Fortune 500 ranks – have embraced employee volunteerism as a fiscally responsible way to supplement and expand on their existing community giving initiatives. But it appears mid-size businesses may not be harnessing the full potential of volunteer programs and are overlooking the wide range of benefits they can provide. Volunteer service can be a powerful tool to help mid-size businesses like Outerwall Inc. – the automated retail company that brings consumers Redbox entertainment, Coinstar money services and ecoATM electronics recycling kiosks, which employs approximately 2,900 employees – recruit new talent, improve morale among current employees and build important relationships in local communities. According to a 2013 Business4Better survey conducted among professionals at mid-size companies (ranging from 100 to 5,000 employees), only 20 percent reported that their employers are tying community involvement to successful business performance, and only 10 percent reported that their employers are leveraging these activities as a tool for employee engagement. While three-quarters of participants said the opportunity to impact communities underscores the need for corporate social responsibility (CSR) programs, only 12 percent said they’ve looked to community involvement to impact the bottom line. When Outerwall first engaged with Points of Light, an organization dedicated to solving serious social problems through voluntary service, the company had far fewer employees than many organizations of similar revenue size, but goals that paralleled its much larger competitors. As a mid-size business, Outerwall had encountered unique barriers compared to its small and large company counterparts, but worked with Points of Light to discover an opportunity to engage its sizeable force of talented and interested employees. In fact, representing roughly one-third of all American jobs, today mid-size businesses employ more than 40 million people in the U.S., and this number is climbing. Mid-size businesses have experienced more substantive and stable growth in recent years than any other business segment, as evidenced by their 2013 employment growth rate of 3.7 percent, compared to 2.1 percent for small firms and 2.6 percent for big businesses. Given this growth, attracting talented employees will be more important than ever for mid-size companies. According to a recent Net Impact study, today employees are increasingly focused on mission-oriented businesses that enable them to bring their values to work and make a difference. In this way, workplace volunteerism programs have a direct impact on a company’s ability to attract new employees. This is particularly true of millennials, who expect the companies they work for to positively impact their communities. In addition to supporting recruitment efforts, volunteer programs can help mid-size companies retain existing employees. By offering exposure to learning and leadership opportunities that may not be immediately available in mid-size firms, strategic volunteer programs can help employees grow both personally and professionally. According to Common Impact, participants in workplace volunteerism programs report that they feel more motivated and more invested in the long-term financial success of their employers. And a recent study from Net Impact and Rutgers University found that employees who believe they can make a direct social and environmental impact while on the job report greater satisfaction than those who cannot, by a two-to-one ratio. Beyond recruitment and retention, volunteer programs allow mid-size companies to make valuable connections and build long-term relationships with important stakeholders. In 2012, A Billion + Change found the return on investment for such programs to be extremely high, generating a value of more than $170 billion to nonprofit organizations, enabling more than 75 percent of companies to develop stronger relationships with key stakeholders, and 61 percent to improve their brand value among target audiences. At Outerwall, volunteer service is considered a valuable component of broader community-building and employee engagement efforts. Outerwall works closely with its corporate and field employees – who are dispersed in communities across the U.S. – to identify integrated volunteer service and charitable giving opportunities. In 2010 the company launched a new initiative that included skills-based opportunities and leadership roles for employees who are interested in the company’s community programs. Since that time, employee participation in workplace volunteerism has jumped from 3 percent to 28 percent and employee perception of Outerwall as a good corporate citizen has risen from 58 percent to 87 percent. For mid-size companies that are trying to enhance their community involvement efforts, we recommend three key strategies: First, tie your volunteerism goals to business goals to gain executive support. Second, collaborate with many groups across your organization to implement and promote programs. And finally, involve employees in the selection of community partners so they feel more ownership and, as a result, will be more likely to take part in volunteer service activities. We’re eager to see more mid-size companies leverage the full potential of their volunteer service programs and other CSR initiatives to do well by doing good. Finding untapped opportunities and turning them into assets may be easier – and more rewarding – than you think. Jackie Norris is the executive director of the Points of Light Corporate Institute, the go-to resource for community-minded companies looking to build and expand effective employee volunteer programs. Nicole Trimble is the senior director of corporate responsibility at Outerwall, the company behind brands including Redbox, Coinstar and ecoATM.